Early Toyota 4Runner models weren’t much more than a Toyota Pickup truck with a camper shell on the back; however, subsequent generations have transformed the 4Runner into a mid-size semi-luxury SUV which still retains some of its original off-road capabilities. While most of the 4Runner’s competitors have switched to uni-body construction crossover SUV’s, the 4Runner still retains a body-on-frame design. 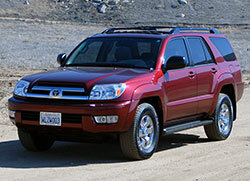 Toyota offers an optional 4.0 L 1GR-FE V6 engine rated at 260 horsepower for 2010, 2011, 2012, 2013, 2014 and 2015 4Runner models. 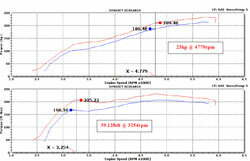 A 260 horsepower V6 isn’t anything to laugh at, but who wouldn’t want to bolt on a few more ponies? A performance air intake system 9002 from Spectre Performance will help to regain some of the horsepower and torque lost due to air intake tract restriction. By replacing the factory air filter box with an oversized open element Spectre synthetic High Performance Racing (HPR) air filter, and eliminating the accordion like hosing of the stock system with a polished aluminum air intake tube, the Spectre Performance 2010-2015 Toyota 4Runner 4.0L air intake system is able to free up a considerable amount of horsepower and torque. The Spectre Performance air intake for 2010, 2011, 2012, 2013, 2014, and 2015 Toyota 4Runner models with the 4.0L V6 engine has been dyno proven to increase horsepower and torque on an otherwise stock 2014 Toyota 4Runner 4.0L. On the dyno, Spectre Performance air intake 9002 showed an unbelievable estimated gain of 23 more horsepower at 4,779 RPM and an unheard of 39.12 lb-ft of torque increase at a commonly used 3,254 RPM. Extra horsepower and torque will boost power for off-roading, towing, road trips, or common every day driving. Owners of 2010-2015 Toyota 4Runner 4.0L V6 models can rest assured knowing that Spectre Performance warrants all products to be free from workmanship and material defects with a limited 90 day warranty. 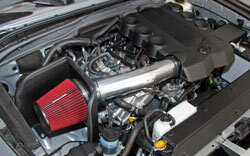 A Spectre Performance air intake system is manufactured using high quality materials throughout. Spectre Performance HPR air filters are built with a pre-dyed synthetic filter media that will not fade, top quality urethane, and steel mesh. Spectre High Performance racing air filters are pre-oiled and ready to use. A Spectre HPR reusable air filter can be serviced when dirty, using part number 884820, and used again. The Spectre 2010, 2011, 2012, 2013, 2014, and 2015 Toyota 4Runner 4.0L air intake system uses a high quality polished aluminum intake tube as well as an air filter heat shield, finished in a textured black powder coat, to help reduce the amount of hot air entering the air filter. The Spectre Performance 2010-2015 Toyota 4Runner 4.0L air intake includes all necessary components and can be installed using basic hand tools. Spectre Performance air intake 9002 is a true bolt on performance upgrade offering more power for less money than other 4Runner air intakes on the market. Since 1983 Spectre Performance has designed and offered unique, innovative, parts and components to fuel your car or truck obsession. Whether your fixation happens to be a classic muscle car or a modern off-road luxury SUV, Spectre will help fuel your passion for performance.